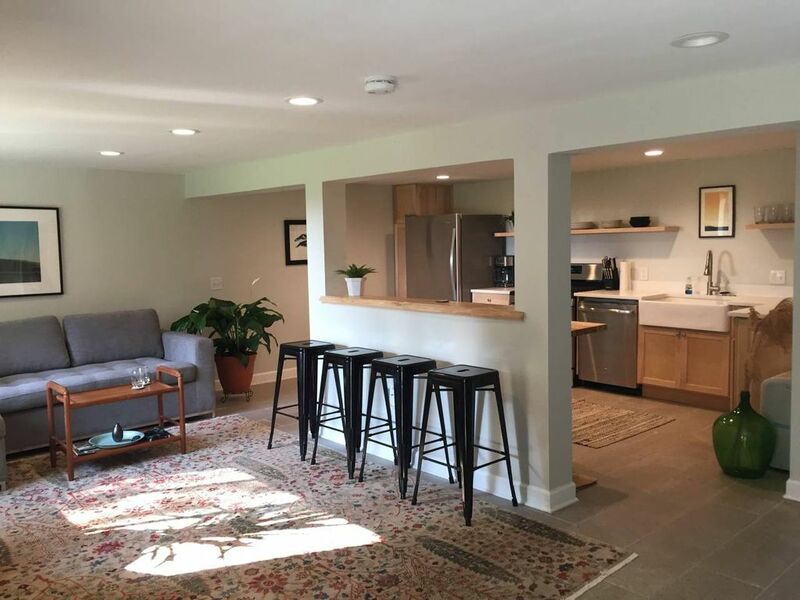 A newly remodeled apartment with a convenient, central location and sweeping mountain views of Mount Mansfield and Camel s Hump. A short twenty-minute walk to Church Street and the waterfront through the city s prettiest neighborhoods, steps from central UVM campus and Champlain College, a five-minute walk to UVM Medical Center. On a quiet dead-end road with easy access to the interstate and 15 minutes from the Burlington International Airport. Relax on your private patio with outdoor dining table and lounge chairs and take in the panoramic views of the Green Mountains! We re available if you need anything but we respect your space and privacy. 2 off-street parking spaces in our driveway with street parking available. Big backyard with an incredible view looking out over the Green Mountains. Private patio with seating available in the warmer months. This is a great place to stay. Great location and beautifully decorated apartment. We had everything we needed for our 3 day stay in Burlington. Kitchen is well equipped, and we loved the very comfortable king sized bed too. This one is a keeper -- we plan on staying here again in the summer. Andy was a great host! He was very responsive with communication and even offered to bring us any supplies which he might have forgotten (which he hadn't, but we definitely appreciated the check-in!). The apartment was beautifully furnished and had everything we needed -- not to mention the most comfortable pull out couch! A huge perk was the washer/dryer which came in handy after a day of skiing in the rain/snow. The location was great - a quick Uber ride into the center of town. Thanks Andy and Kati -- we had a wonderful stay and will definitely look to come back next time we are in town! Enjoyed my stay. Convient locatiion to downtown Burlington.